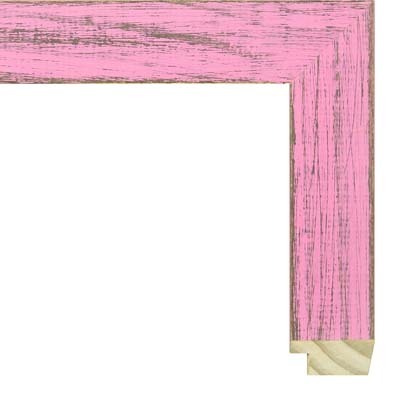 Due to the depth of this rustic pink wood picture frame, ideal art items to frame include matted paper items and thin canvas boards and other thin rigid material. While a ¾”canvas painting could be attached to the back of the frame with offset clips, deeper canvases may have the undesired effect of sticking out the back of the frame in a noticeable way. Paper art items that could be matted and framed in this wood picture frame include posters, prints, drawings, watercolor paintings, relief prints, silkscreen, intaglio, gouache and tempera paint on paper, and acrylic on paper, along with oil paintings on canvas board and acrylic on canvas board. For matted items, consider archival colors from our acid free selection such as Cotton Candy 9567, Carnation 5647, Geode 9558, Easter Egg 9560, Grape Jelly 9562, Dark Purple 9886, Purple Mountain 9564, White Glove 9500, and Jet Black 9848.